Word is they loved Ruston. Do you mean he's gone after only 4 months?! Show me a coach who loves the town he works/lives in and I’ll show you a coach who will jump on the first train out that another school buys a ticket for. So where is he going and who is our potential replacement? He is going to Colorado. The state, not the school. No job, just home. COYHCSH has not had time to find a new man yet. And don't let the door hit you in the behind! 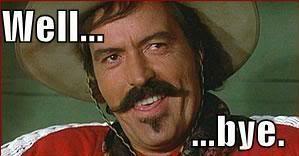 Just about any situation in life can be summed up or explained by a line from the movie Tombstone.